Accenture is a global management consulting, technology services and outsourcing company serving clients in more than 120 countries. The range of clients we work with will provide you with a truly well-rounded professional experience and the opportunity to develop customized, next-generation products and services designed for today’s connected landscape of disruptive technologies. Accenture organizes student events throughout the year to network show what working at Accenture means and requires. 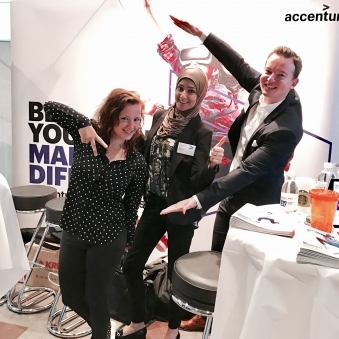 Meet us at campus career fairs or try out your consulting skills in our yearly Consultant for a Day providing you with insights and experience in how Accenture solves cases. Follow our Facebook page to get notified about upcoming events at your university. Don’t miss out on becoming our latest team member!